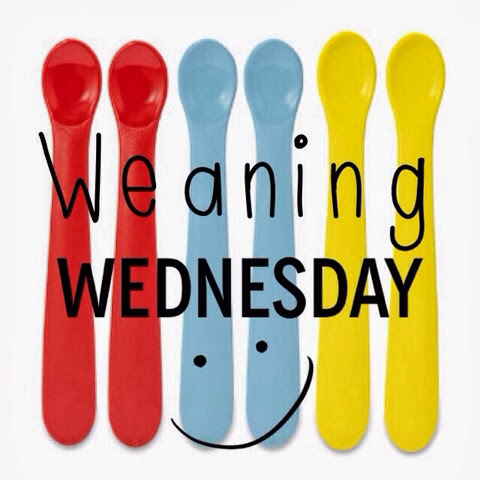 Last week, I shared my weaning plans with you and we're now a week in and so far, it's been quite good! Ethan's first food! Wow. He's getting so big but looks so small in his highchair. I've got everything to hand - disposable bibs, weaning bowl and cup, baby rice, wipes. I've done my reading too - Annabel Karmel's Weaning and Meal Planner books, which have been really helpful and I can tell they will be great at guiding us through the next few weeks. I made up a small amount of baby rice using Ethan's usual milk. I could tell I'd made too much but I was trying to get the yoghurt consistency the experts recommend. Ethan was receptive to me putting the spoon in his mouth and made a few funny, scrunched up faces, but took the baby rice. He had a couple of spoonfuls, some leaking out so I had to try and scoop it back in. He had a little choke towards the end but he quickly settled as he realised what to do. We then took him out his chair and gave him a bottle of milk. He wasn't sick and seemed happy enough after. Phew, we're over the first hurdle! He has conjunctivitis, which is why he looks a little crazy here! I was really excited to try feeding Ethan again. I opted for lunchtime again, his third feed of the day, and thought it best to stick to the baby rice. Ethan was in a very happy mood and opened his mouth each time he was presented with the spoon, smacking his lips after taking the baby rice. He was so content, I managed to feed him most of the baby rice I'd made, around six spoonfuls, followed by a few sips of boiled, cooled water from his Tommee Tippee first cup. Again, finished with his usual milk bottle and he was very happy, as was I. This is fun! I then spent some time steaming the flesh from the pumpkins we'd carved for Halloween, two sweet potatoes, three carrots and one head of broccoli. When these were soft, I blended them and got four freezer pots worth from each vegetable. Making it yourself is easy and I can see it's going to be a lot less expensive too. Ethan was weighed this morning - he's a healthy 16lb 4oz. So pleased he's doing well and I couldn't wait to try feeding him again. I'm going to try a vegetable purée tomorrow but today gave baby rice by itself one more time. He happily ate everything I offered him and finished what I had made up for him. I know it's not a lot compared to what he will eat but for now, it seems like he ate loads and importantly, he enjoyed it and was fine afterwards. I thawed a pot of sweet potato I had made in a bowl of boiling water for 45 minutes. After checking it was defrosted, I mixed in a little of his normal milk to make it smoother. He wasn't sure at first and we were again treated to some funny faces but he remained happy enough and let me feed him quite a bit. He didn't bring anything up and again, was happy to finish off his lunch with some milk. It felt great to feed him something that I had made myself. Sweet potato again and this time, Ethan had an audience! Nanna and Gramps joined us on Skype for his second serving of sweet potato but this time, he wasn't quite so keen. He started to cough from the first spoonful and had a pretty unhappy face! However, he then had quite an unsettled afternoon, not napping for long, taking ages to have his milk and then he was up really late, taking four attempts to get him to bed. Just a bad day or could it be him adjusting to weaning? Next vegetable up, carrot purée! Let's see if he likes this any more than sweet potato... Unfortunately, he didn't seem too keen! It was a little lumpier but I tried adding some milk half way through feeding Ethan to see if that would help. Most of the spoonfuls I gave him came squirting out his mouth again but I think he did manage to eat some. He wasn't as enthusiastic today but then again, he didn't finish either of his bottles this morning. Well, at least he tried it. Perhaps we'll try something else tomorrow. I decided to give pumpkin a go to see what he made of it. At first, I thought he wasn't too keen but after persevering, he started to open his mouth without need for encouragement and was almost sucking the purée off the spoon. He happily had a few mouthfuls before getting restless - I think he likes his pumpkin! So, week one is over and I think Ethan is enjoying weaning. He seems to like being in his highchair and knows that it's something exciting to look forward to. The baby rice was a great first choice for him and hopefully he starts to enjoy his vegetables more. The sweet potato and pumpkin were easiest to purée really smooth and I'm going to try some apple soon too. Annabel Karmel recommends that in week two, you try and feed them twice a day so I think we'll have a go at baby rice or porridge mid-morning then try a vegetable or a fruit puree later on in the afternoon.